Mazda 3 | What Car? Mazdas updated 3 shares the limelight with its new CX-5 SUV at Frankfurt. The 5dr hatchback range has a number of improvements, including a mild face-lift, more efficient engines and chassis changes for better ride and handling. The styling changes are subtle, but bring the 3 into line with Mazdas latest design philosophy. The redesigned front bumper includes new round foglights, while the rear bumper has been re-shaped to make loading and unloading the boot easier. There are also new rear lamp reflectors, fresh alloy wheel designs and a new Autumn Bronze Mica paint option. Inside, theres now a black finish for the lower centre console, with brighter chrome rings on the control dials. There are new graphics and instrument displays, too. Although the engine range hasnt changed, the 3s new front bumper design and additional under-body covers bring improved efficiency for most versions. CO2 emissions for the 1.6 and 2.0-litre petrol engines with manual gearboxes have dropped by 2 g/km. Those for the automatic and MPS performance versions are unchanged. CO2 emissions for the 1.6- and 2.2-litre diesel engines have dropped by up to 3.5%. There are chassis tweaks aimed at making the 3 better to drive, including stiffer wheels, extra body reinforcement, tuned dampers and changes to the steering pump. Extra under-body insulation is designed to reduce road noise in the cabin. 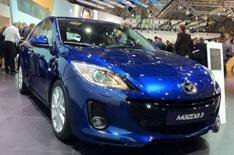 Mazda hasnt released prices, but wed expect them to be little changed from the current cars. A UK on-sale date hasnt yet been confirmed.